I'm looking for ideas to decorate the baby's body, embroidery, felt applique, I wonder what would look best. Are you working on the clothing or the face/hands, or both? For the face, beads or plastic eyes (with posts/washers) could work well, as could felt applique for the eyes, and embroidered nose/mouth usually works for me. (With felt dolls, admittedly, not amigurumi dolls, but the principle is still similar?) Possibly embroidered nose, felt eyes, felt pacifier? Depending on what you want. For the body/clothing, I'd try felt applique, I think, if you have the scraps and/or don't mind using craft felt. That way, the worst-case scenario is it doesn't look right and you've only wasted a few cents' worth of fabric. Alterately, teeny knit or crocheted things appliqued on might work well? I <3 plushies! If you like my designs, I'm up for discussing swaps or commissions. Maybe a bonnet? 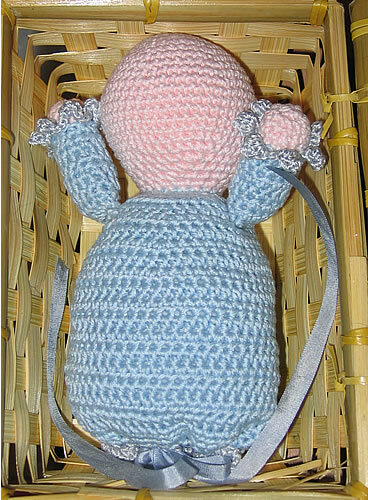 Or a crocheted pacifier? Thanks for the suggestions. I will definitely make a bonnet. I think I will try to embroider closed eyes and a mouth, I would like to try blushing the cheeks but I'm afraid to ruin the cheeks. I have lots of felt so I will try to find drawings of baby-related things that I could trace and cut in felt to decorate the body. if you have some pink felt you could always cut out some little pink ovals for the cheeks. That would be cute and wouldn't ruin the face like make-up might. And it won't wash off. Here's another photo. I decided to use hearts to decorate the body. I'm afraid to botch the face and ruin everything. Aw it's cute! Great work! ooh he is so cute! I made my daughter a bunting doll similar to that one and neither of my daughters seem to mind it doesn't have a face. I like it better without a face.